Margaret Thatcher, in discussion with Deng Xiaoping, reiterated the validity of an extension of the lease of Hong Kong territory, particularly in light of binding treaties, including the Treaty of Nanking in 1842, the Convention of Peking in 1856, and the Convention for the Extension of Hong Kong Territory signed in 1890. 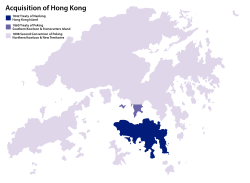 During talks with Thatcher, China planned to invade and seize Hong Kong if the negotiations set off unrest in the colony. Thatcher later said that Deng told her bluntly that China could easily take Hong Kong by force, stating that "I could walk in and take the whole lot this afternoon", to which she replied that "there is nothing I could do to stop you, but the eyes of the world would now know what China is like".